Up in the forested mountains 25km south of Kathmandu, the village of Ghusel clings to a steep slope overlooking the gorge of the Bagmati River. This time of year, the monsoon mist spreads over the ridges like a gauze curtain. Airliners glide by through the narrow valley below, descending to Kathmandu airport. All 376 houses in Ghusel were either completely destroyed or damaged in the earthquake, killing five people. Most families have moved out, and there are bushes growing from the ruins of their homes. Many who stayed are spending their third monsoon in temporary huts. But not Tempa Lama (right).He is living in a sturdy house with concrete pillars and timber beams which he built with his bare hands and a loan. He also restored his family’s thriving vegetable farm, an orchard and raises livestock. 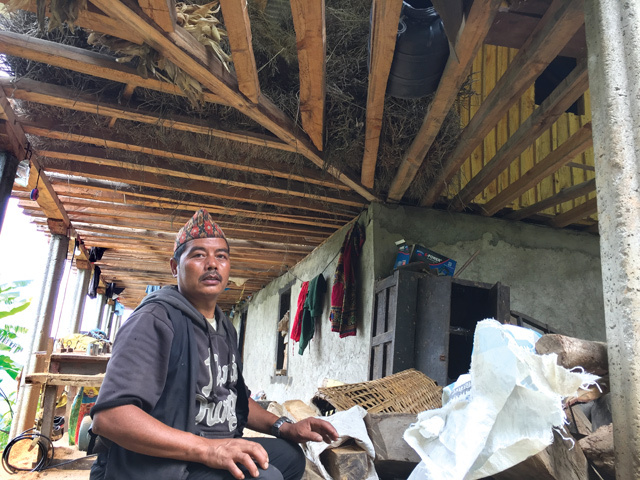 “Waiting for the government housing grant was taking a long time, so I mustered up the courage to take a Rs700,000 loan and rebuilt the house myself,” says the 51-year old farmer, whose home is the only one so far to have been rebuilt in Ghusel. One bright morning this week, Lama was sawing planks with an electric saw he rigged up himself. In between, he rushed off to add fodder for the buffaloes and inspect his maize field. “I am thankful not to have to spend another rainy season under the tent. That is where I would still be if I had waited for the government,” he says, proudly displaying his new house for which he was mason, carpenter and plumber all rolled into one. Lama used to be a landless farmer, and without waiting for handouts independently built a future for his family after moving to Ghusel. Going by the way he is greeted, Lama seems popular in the village, and respected for his hard work, skills and integrity. Lama’s neighbour Chabilal Ghimire, 75, describes him as a man of substance. “I am an old man but I am inspired by Tempa Lama. 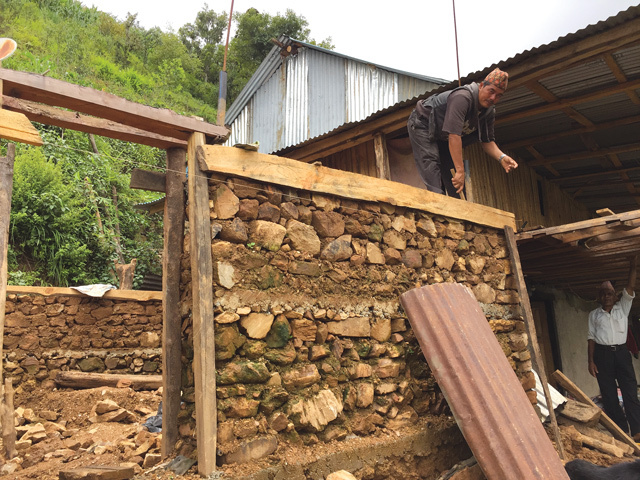 He has set an example for all of us with his skill and work ethic: everyone in the village is now saying we can rebuild ourselves,” Ghimire tells us. Lama earns a living with his carpentry, and on the side sells milk, honey, fruits, vegetables and seasonal cash crops. He is on track to pay back his loan. Lama counts his blessings, and say he was lucky his buffaloes, cows and goats survived the quake. It would have been more difficult had they been killed. 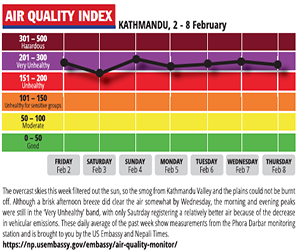 Lama’s case illustrates how important it is for earthquake victims to have livelihood options. A housing grant alone is not enough: they need support to acquire skills and find jobs. The National Reconstruction Authority (NRA) in Kathmandu says it will focus on ‘socio-economic reconstruction’ this year, specifically sustainable livelihood options (see Guest Editorial, page 2), but that it also needs to expedite the reconstruction process. Lama had already started rebuilding by the time he received the first tranche of the NRA's housing grant. He is constructing another house nearby, as grant recipients need to rebuild using government-approved designs. Although some earthquake survivors in Ghusel have already received the second tranche, they don't want to rebuild their houses just yet. 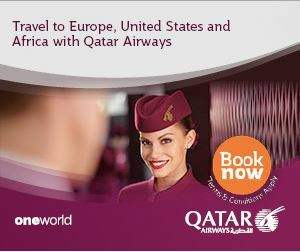 The money is not enough, and many would rather migrate and send money home. Local trader Him Sen Satyal says about 15% of the earthquake survivors in Ghusel took the second tranche. but moved to Kathmandu or abroad, leaving their homes in ruins. Just before noon on 25 April 2015, there was an ominous subterranean roar, and the earth started shaking. The stone and mud houses in the village of Rayale, just over the southwestern ride of the Valley in Kavre, didn’t stand a chance. Some 250 homes came down that day, killing 3 people in Rayale alone. Rebuilding of such houses has been the main priority of the National Reconstruciton Authority (NRA), but for various bureaucratic and political reasons the work has been delayed. Rigid house designs were proposed before villagers could receive grants, there were impractical suggestions for relocation, and the big promises of financial help from various prime ministers did not materialise. 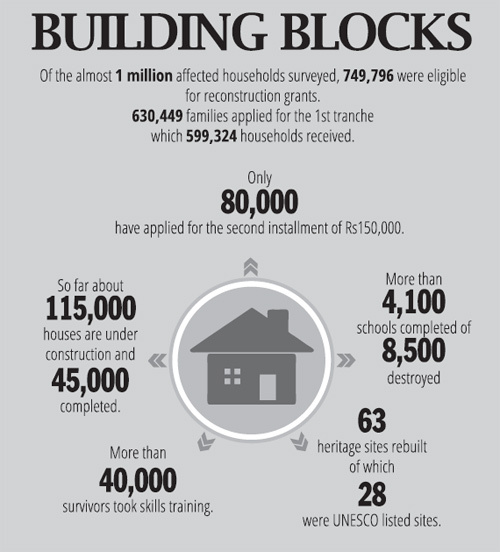 Amidst this confusion, organisations like Steadfast-Nepal have quitely advanced rebuiling. It introduced an innovative technique using polypropylene bags filled with earth as the building blocks for new construction. Houses built with earthbags have better climate control, are earthquake resistant and resemble traditional houses. Earthbag homes have thick walls that are firmly anchored with steel rods and wires, they are made with local materials and local labour, and preserve the traditional aesthetic and architecture – and can be completed within a month. “They are cool during summers and warm in winters. 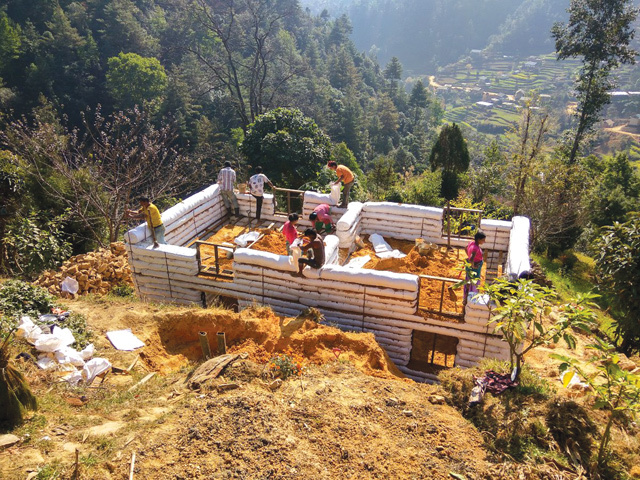 We believe they represent a practical, localised approach to responding to the rural housing crisis after the earthquake,” says Diana Silwal Pradhan of Steadfast-Nepal. Govinda Pokharel, head of the NRA, attended the recent inauguration of 120 of the earthbag homes, and complimented the builders for the speed with which these strong houses were put up. Bhim Neupane, mayor of Panauti Municipality, and Kavre CDO Shiva Simkhada recommended that at least another 100 houses in Rayale could be built with this technology. Earthbag technology has been used in many earthquake-affected districts for homes and schools, by organisations like Small World and Firststep Himalaya.